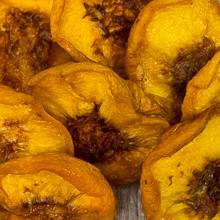 These are thick and meaty dried peaches - we refer to them as "peach filets." They're wonderful snacks; or you can simmer them in a sauce for chicken or game for an elegant presentation. Price quoted is per pound, not including shipping.